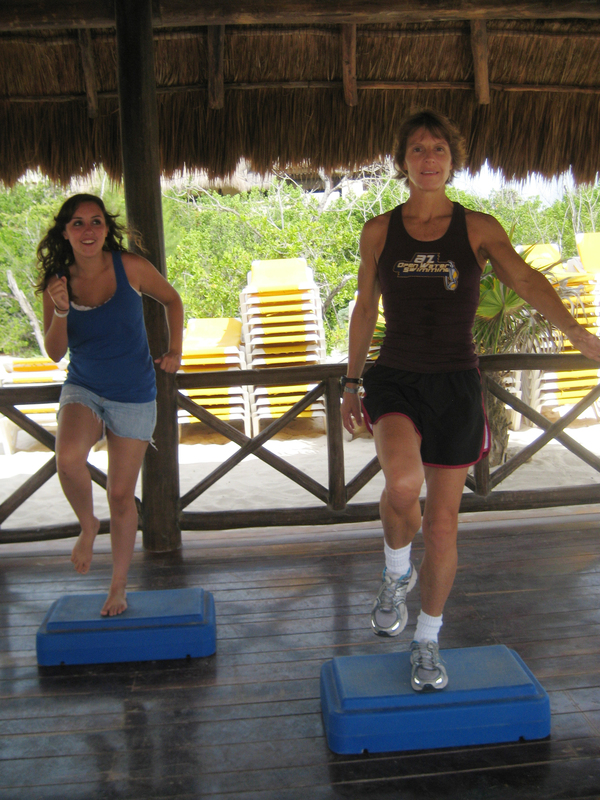 Stepping in Cancun (This is a mock class with my daughter in the background - I don't let my students step barefoot). I once worked at a fitness facility with a women who smoked right before she taught her classes. That always really bothered me, someone who stood up as a role model in front of others walking into her class with the smell of smoke on her breath, practically advertising that the healthy lifestyle she preached about wasn’t the one she actually led. Although I consider myself an exemplary role model for health and fitness, I still find it beneficial to give myself a periodic evaluation to see if there is room for improvement. To me, one of my responsibilities as a certified personal trainer and group exercise leader is to demonstrate to partipants and clients the benefits of a healthy lifestyle. That means following the ACSM guidelines for health aerobic and strength exercise to maximize my cardiovascular and musculoskeletal health and eating healthy so I stay within healthy weight limits. I’ll be the first to admit that class participants have spotted me at the grocery with beer and ice cream in my shopping cart and that it made me feel a tad guilty. I will tell you that there were also healthy foods in there and that my diet philosophy is moderation, not obsession. At least one person a month usually asks me if I only eat raw vegetables, as if to look good you have to starve. Not! I eat whenever hungry and have maintained a weight 10-15 pounds less than when I was younger and trying all kinds of crazy diet plans. Experience and education have taught me that the best “diet” is one that includes a balance of the major food groups (with an emphasis on fruits and veggies) and minimizes processed foods high in fat and preservatives. I most often go askew in good example setting with my athletic endeavors. As a nationally ranked competitive swimmer and occasional triathlete, I train numerous hours weekly in addition to teaching 7 or more fitness classes. I have to remind myself periodically that fitness is my career, whereas competitive athletics are only a hobby. When I keep my priorities in order, my competitive events and training don’t adversely affect my work. The only two injuries I’ve ever had (a rotator cuff tendinitis and a sacro-iliac tendinitis) both occurred, not because of a fitness class, but because of training or competing outside of class. Especially now that I’m in my late 40s, I have to be more prudent than ever training and spend more time warming up, cooling down and stretching. 4 – Instructor arrives to class obviously sick (coughing, sniffling, etc.) If at all possible get a sub, but I know from experience sometimes this is nearly impossible and someone has to teach the class, right? OK, so in a pinch, take some really good cold medicine first? 5 – Instructor arrives to class slightly limping (Yes, this has been me after a half marathon or a couple of weeks ago when I challenged my husband to a 3 mile race – I’m still working on my area of weakness 🙂 ) But what I and you should do is follow that RICE formula we preach to others and get someone to cover until the injury’s better. 6 – Instructor wears baggy clothes and constantly talks about how fat she is when she’s practically wasting away. Silence! It will make your class participants feel bad about themselves when someone so obviously thin or underweight is so self-critical. 7 – Instructor wears clothing that is ripped, dirty or too revealing. Fitness attire should always look neat and professional (one time I arrived to class wearing a red-rimmed Nike Vomero on the right foot and a blue one on the other – Oops). As fitness professionals, we have the opportunity to be living examples that exercise works – it makes you feel great, look great, and have a better quality of life. By “practicing what we preach,” we enhance our influence and our credibility. You are right- a fitness instructor must practice what they preach. Even elite atheletes eat bad food in small quantities so you don’t need to be superhuman. But you DO need to be fit. Nothing wrong in doing stepping workouts barefoot by the way- many kettlebell classes and circuit based gymnastic routines can be done barefoot if the student feels more comfortable that way. At least thats, coming into fashion in Australaisa and the UK. It actually increases mobility and therefore potential ankle and knee stretch. Thanks for reading. Where do you teach? I discourage people from doing impact classes barefoot, because it increases the risk factor for stress fractures and other injuries. I won’t even allow someone in a class with weights because they could possibly drop one on their toe and break something. Many gyms in the U.S. have insurance policies that require footwear in exercise areas where there are dumbbells and other heavy equipment. I encourage people to go barefoot if they like in balance class because it gives students a chance to feel the floor and strengthen ankles without a lot of trauma on joints.